Today is Administrative Assistants day and while I did make the card for everyone in the office to sign for our office manager, Jen, I wanted to make her a little something just from me. Jen has a Maltese named Oscar and she is as crazy about little Oscar as I am about my little Lucy. I knew what I wanted to make her and have known for sometime but of course waited to the last minute *okie is such a procrastinator* partly because...well okay...totally because I have just been out of the mood to do any paper crafting. Good thing was that since I had been thinking about this I was able to sit down and get my cuts ready in Design Studio, save the file, and then do the cuts the next evening *okie thinks that DS can be such a life saver sometimes*. The patterned paper I believe is from Making Memories. For the gift bag I used Tags, Bags, Boxes and More. I cut the bag as big as I could for a 12x12 piece of paper. I had to "trick" my cricut into thinking it was cutting on a 12x24 mat so I could get to the very edges. I used 1/4" grosgrain ribbon for the handles on the bag. I did add two dog bone brads to the front of the bag for some little extra embellishment. The "I love my Dog" on the front is a 3-D sticker that I had in my stash and the colors worked wonderful for the paper. I inked the edges with Chestnut Roan Cateye Chalk ink. I did use my ATG gun to put the bag together. And yes...the album does fit in the bag.......barely.........BUT IT DOES!! For the album I used my Bind It All to hold the album together using 1" wires. For the cuts I used Paper Pups, Mini Monograms, Jasmine, George and Basic Shapes and Cuttin Up. This is the front and back of the album. 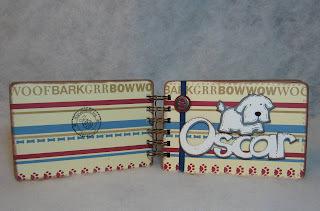 I used Paper Pups for the puppy and Cuttin Up for the name Oscar. I also used a brad that has a fire hydrant on it with a piece of ribbon to kinda jazz up the front. I did also due a double stitch hand doodle around the front. On the back I just stamped it with my okieladybug stamp. Here are page 1 and 2. I used Mini Monograms for the picture mats. 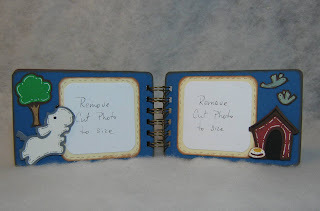 I did make little removable white mats so she can trim her pictures to size more easily. The paw prints on the red paper are done with a paw stamp and a Versamark Watermark ink pad. It is the first time I have really gotten to use it...and I do believe I am gonna love the watermark pad! Here is page 3 and 4. I used my Purple Cows cutter to cut the mat and chose the deckle blade *which is okie's favorite*. I used Jasmine for the photo corners. 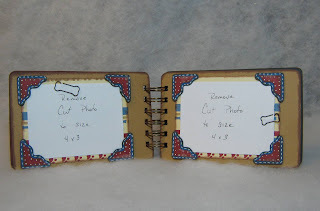 I added two little dog bone paper clips just for some extra embellishment since these two pages were a little plain. I wanted her to have a couple of pages that could hold good size photos. And again the white mats are for picture reference. Here is page 5 and 6. All the cuts on this one are from Paper Pups. I tried to make it into a scene of sorts. The tree and the birds are adhered directly onto the page but the puppy and dog house are pop dotted to give it a more dimensional look. Awesome album! I think you're back to crafting some really great suff. Keep it going. Okie, simply adorable. I'm sure she is going to love it. You will have to let us know what she said about it. 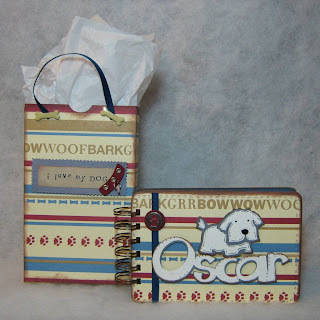 So good to see your scrapping again Okie :-) This is just the cutiest bag and "doggy brag book" she is sure to just love it!! When you make your albums for people are the white areas for photos removable? How do people put their pictures in them and make them look like they fit? So CUTE!!! I absolutely just love the adorable Doggie Album. Glad to see your back! We've missed you! 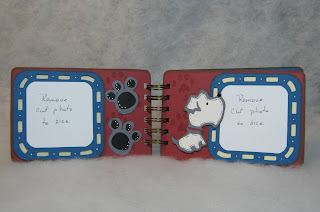 This is just great Okie - such a cute album and it is nice to see you crafting again! Okie - I left a little something for you on my blog - thanks for all your inspirating projects! And by the way - great job quitting the smoking! YOU GO GIRL! This is just AWESOME!!!! Love love it. Yay Okie!!! You are back!!! wow this kept you busy, and it looks so nice the little doggie is so cute. wel done Okie. Keep up the good work. She's gonna love it!! It looks great!!!! It is so good to see you crafting again!!!! Did your head aches finally go away? Take Care!!! You've been missed!!! that is absolutely adorable okie! you did an amazing job! the colors are fantastic too!! Hugs! It is AMAZINGLY CUTE and we are glad you are getting your mojo back...YIPPIE!! Glad to her you are back in the game. If you need further inspiration check out the video I posted today. I hope it makes you laugh. These are just too cute! So glad to see you creating and posting again! Glad to see you crafting again! This is so adorable!! Congrats on not smoking!! Very cute Okie! Glad to see ya getting back into the swing of things!! We've missed ya on the board and seeing your great talents! Good luck with everything and have a great weekend! Such a cute idea, TFS! Okie, It's adorable. I love it!!! I want one. We just got a new dog from the humane society this would be a great little book to put his baby picture in. Hope you are doing good okie, miss your inspiration! Just wanted to say thanks for sharing your files. I really enjoy seeing how creative people are. That's awesome! You really rocked that one! Too cute!!! I have a Pug named Oscar!! What a fabulous gift!!!! Hope you get your desire for papercrafting back soon, you are so amazing!!! 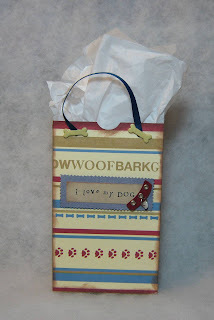 Oh, what a sweet gift for a dog lover! Love all the special touches and details you added to make the album so special. Your office manager is so lucky to have received such a beautiful gift! This is way to cute. I bet she really love getting this from you.